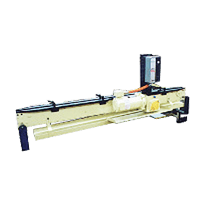 Model 1650 — Feedall conveyors offer entrance, intermediate and exit capabilities for a wide variety of machine tools and processes including centerless grinding, thread rolling, belt finishing, heat treating and assembly. Special design considerations allow these conveyors to operate in harsh environments (oily, chips, grinder swarf, etc.). Conveys steering racks to a Cincinnati centerless grinder. Conveys punch and dies to the workrest of a Cincinnati 350-20 centerless grinder. Conveys bearing races to the workrest of a centerless grinder. Accepts swaged tubes from a swaging machine onto an air-operated rotary/transfer device. This device orients tubes with alternating end selection so that swaged ends are together, then lift and transfer onto conveyor feeding tubes end-to-end to the workrest of a Cincinnati Model 340-20 centerless grinder. Accepts steel bushings from previous operation via a robot and conveys them in a continuous, diameter-to-diameter stream to an air-operated pusher device. An air operated escapement device releases additional bushings on demand from a level switch to another air-operated pusher device. The pusher devices discharges two bushings on a prescribed center-to-center distance for gantry pick-off loading an OKUMA dual spindle CNC lathe. Accepts track pins from an existing magazine and convey to the workrest of a Cincinnati centerless grinder. Accepts strut shafts from customer’s step feeder one at a time at 44″ above the floor and conveys them to the workrest of a CINCINNATI Model 350-20 RK Centerless Grinder. to the workrest of a CINCINNATI Model 340-20 DE Centerless Grinder. CINCINNATI Model 340-20 DE Centerless Grinder into a collection tray.